It's almost Hearth's Warming, and the school is going on a holiday break. All the students are getting ready to head home. Then a mysterious figure pours a substance onto the spell at the top of the tree in the common area, and it explodes into a mass of sticky purple goo all over the room. Twilight and Rainbow Dash chase after the perpetrator, but they don't see who it is, only where they went - the dorm where the students are packing. All the students in the group are under suspicion for pulling this messy prank, and Twilight tries to get the guilty party to confess by saying they'll all have to stay over break otherwise. No one comes forward, and she and Rainbow begin interviewing the students separately out of the room, while the rest of the group starts cleaning up. 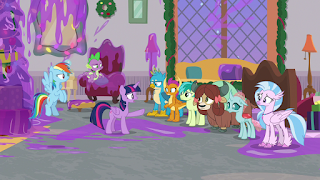 As the interviews happen off-screen, we get to the fun part of the episode: each non-pony character explains their holiday traditions to the others. Ocellus, a young changeling, explains that they've recently adopted the pony holiday. It's clear that they took some descriptions of activities far too literally, but she's happy with their spin on Hearth's Warming and doesn't want to miss it. Yona, a yak from the fantasy-barbarian-ish Yakyakistan, describes their awesome holiday of Snilldar Fest, which involves plenty of celebratory smashing, but also family traditions - she went through a sort of coming-of-age ritual the previous year. Dragon Smolder explains the Feast of Fire, which involves storytelling and feasting (and bragging and competition - they are dragons, after all). Silverstream, a Hippogriff (they make very little sense if you haven't seen the movie), shares a story with her friends about the celebration that she is longing to go home for, especially since the tradition was expanded from one day to three days after the events of said movie. No one confesses to pulling the prank, and the students begin to accuse each other in frustration. Gallus, the griffon, finally breaks it up by confessing to the prank. He didn't want to go home for the Blue Moon Festival, as even though it's the time of year when the notoriously cranky and isolationist griffons aren't outright mean to each other, he doesn't have any family to spend it with. Twilight (listening from around the corner) thanks Gallus for being honest with his friends, and they not only forgive him, they offer to stay at school over break so they can all celebrate together. I like that this episode added additional holidays to the world, even if most of them are fairly simplistic as described here. However, most of the non-pony races started out as one-note tropes (dragons are selfish and dangerous, griffons are rude, etc.) and they've been expanding further and further as the series has gone on, so this is a nice little continuation of that. It's also fun to get a focus on the new characters, but because of all that, I wouldn't necessarily recommend this episode to anyone who's not already a fan of the ongoing show.